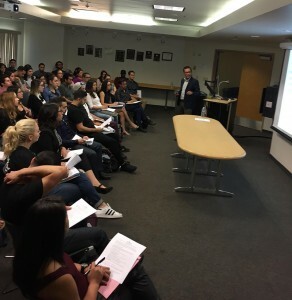 Diego Cartagena, vice president of pro bono services at Bet Tzedek, provides training on the legal issues raised for U.S. citizen minors when a parent is deported, to CSUN students in spring 2017. Photo courtesy of Hilary Goldberg. In the melting pot of Los Angeles and especially on the diverse campus of California State University, Northridge, countless residents work with or know someone who has struggled with immigration issues. Many have been personally touched by these struggles. In this climate, faculty members in the David Nazarian College of Business and Economics have stepped up to take action the best way they know how: through volunteerism and legal aid. In the spring, Hilary Goldberg, assistant professor of business law and real estate, and her colleagues joined forces with nonprofit legal organization Bet Tzedek to mobilize more than 130 CSUN students and faculty volunteers to assist local families. This fall, they’re expanding their efforts. Bet Tzedek and the Nazarian College faculty will offer a training session from 6 to 8 p.m. on Monday, Sept. 25, in the Ferman Presentation Room of the Delmar T. Oviatt Library. The training is free and open to the public, as well as to CSUN students, faculty and staff. Bet Tzedek, which means “House of Justice” in Hebrew, is committed to helping families prepare for the aftermath of a child having one or both of his or her parents removed from the United States. The nonprofit is funding the training at CSUN. During the session, Diego Cartagena, vice president of pro bono services at Bet Tzedek, will provide training on the legal issues raised for U.S. citizen minors when a parent is deported. He’ll also cover the applicable laws that permit parents to designate caretakers or guardians for their children, as well as providing a primer on the necessary legal forms and affidavits. The end of the training session will include time for Q & A and networking. After volunteers attend the training, Bet Tzedek staff will work with them to schedule shifts at the organization’s public legal workshops, which are usually between one and three hours and offered multiple times throughout the semester. At the workshops, volunteers are paired with undocumented parents to complete forms and “caretaker affidavits” — to help children avoid foster care by being placed with other relatives and friends — under the supervision of Cartagena and other Bet Tzedek attorneys. “I love this program because, aside from providing and promoting high-impact community service work, it provides a powerful educational and human learning experience for students in a short period of time, making it accessible to our dynamic working-student population,” said Goldberg, also an attorney. The Red Cross estimates that there are approximately 250,000 U.S. citizen children of undocumented parents living in Los Angeles County. Sandy Samuels, an adjunct professor of business law in the Nazarian College and former president and CEO of Bet Tzedek, made the connection between the organization and CSUN. Other CSUN support has come from the DREAM Center, Department of Social Work, Oviatt Library staff and William Watkins, vice president for student affairs and dean of students. The involvement of the CSUN community has been crucial and steadfast this year, Cartagena said. In anonymous surveys, participating CSUN students were effusive in their praise for the program and the opportunity. The partnership has born fruit so quickly that Bet Tzedek is considering CSUN for more projects, such as involving students and faculty as volunteers with its clinics that help with employment law and landlord-tenant issues, Goldberg said. The Oviatt Library is located at the heart of the campus, at 18111 Nordhoff St. in Northridge. Parking permits are available at kiosks around campus or the information booth on Prairie Street at Darby Avenue.